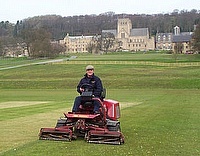 Ampleforth College in North Yorkshire is the largest private Catholic mixed boarding school in the UK, and is sometimes referred to as the â€œCatholic Etonâ€. It first opened in 1802 and is run by the Benedictine monks of Ampleforth Abbey, the Community of St.Laurence, who can trace their origins back nearly 1000 years to medieval Westminster. Using the Spiker Slitter on our Ultra Dwarf greens has proved very successful, particularly during periods of high play. Ultra Dwarf grasses are dense so using a Spiker Slitter between regular aerating improves air and water exchange. With the Spiker Slitter and Twinplay set on my tractor I can do all 18 greens in 2-3 hours. The Cliffs Communities, nestling at the foot of The Blue Ridge Mountains between North and South Carolina, offers the highest standards of luxury living combined with wonderful golf courses. The Cliffs at High Carolina will soon be home to the first Tiger Woods' designed golf course in the USA. The athletics facilities at Hillcrest High School in Simpsonville, SC, were built in the 1950's and are Bermuda, overseeded with perennial rye. The fields had never been verticut so a deep thatch layer had built up. With the level of play there was also considerable compaction. It is always satisfying when a demonstration goes well - but we can't beat our experience at Golden Hills Country Club in Lexington, SC. Supt. Chad Berry was so impressed with the SISIS Multislit deep slicer on its prototype attachment frame for Cushman trucksters, that he bought (and paid for) the lot on the spot! SISIS Auto-Rotorake "Most effective treatment"
Five years ago SISIS North America was delighted to supply an Auto-Rotorake to the University of Florida. 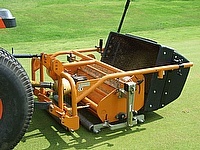 The Auto-Rotorake fitted with the verticutting reel was the only de-thatcher used for a research project into UltraDwarf grasses. The Auto-Rotorake has proved very reliable over the length of the project and was found to be the most effective treatment for the removal and control of the build-up of excess organic matter. 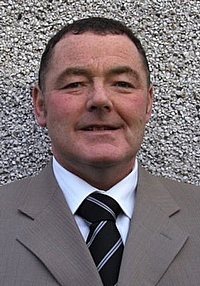 SISIS Equipment (Macclesfield) Limited are delighted to announce the appointment of Ewen WIlson as their Exports Sales Manager. 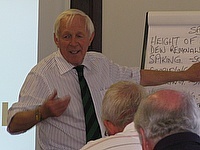 Ewen has worked for the Company for 26 years as their demonstrator in Scotland and Northern Ireland and, in addition, has undertaken many demonstration trips overseas. The SISIS Flexicomb has 60 sets of polypropylene bristles which can be made stiffer or softer by adjusting the crossbar. 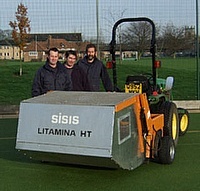 On synthetic surfaces the Flexicomb ensures even distribution of infill material and lifts the pile. 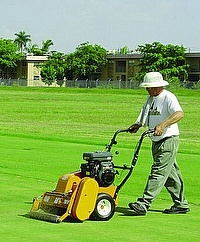 The Flexicomb is very effective on natural turf and can, depending on the chosen setting, be used as a brush or as a rake. The Solvert sales staff were instructed on the correct operation of a range of machines and also the features and benefits. Amongst the machines were a number of new or recent introductions including the SISIS Arrow-AerAid pedestrian aerator; the Rotorake 602S with seeder option and also the towed implement frame with attachments for synthetic pitches. St Peter's School in York is a co-educational independent school for 13 -18 year olds which prides itself on its excellent sports facilities. These comprise a new multi surface pitch, two sports centres, gymnasium, indoor swimming pool, extensive playing fields, boathouse, netball and tennis courts. 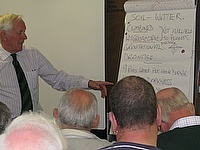 Following their recent highly successful series of bowling green maintenance seminars in teh north of England and western Scotland, Dennis and Sisis are pleased to announce their next Seminar will take place on Wednesday 23rd May 2012 in Northampton. In September, SISIS dealers and Independent Representatives from as far afield as Arizona,Nebraska, Texas, Florida and New York travelled to Clemson for the launch of the SISIS AER-AID SYSTEM on to the USA market, and to see a demonstration of the recently introduced SISIS OSCA Oscillating Brush.